India, France Pledge Cooperation, Sign Multi-Sector Deals - Integration Through Media ....! 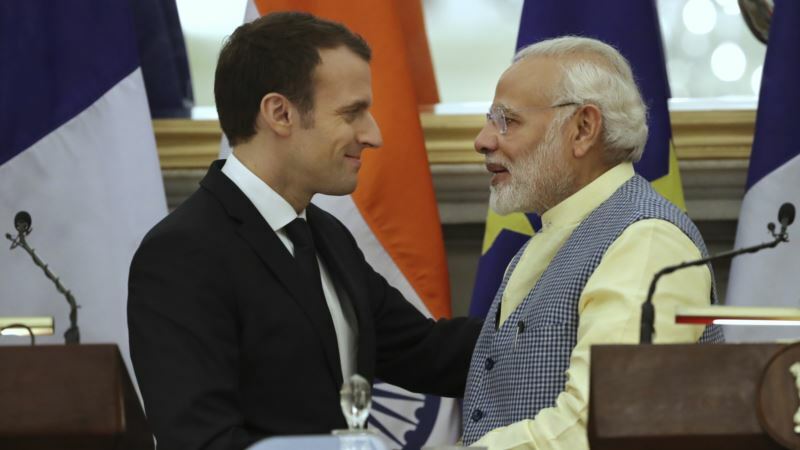 (VOA): India and France pledged Saturday to work together to ensure freedom of navigation in the Indian Ocean and signed an agreement to expedite construction of a major nuclear power plant in India by a French company. After talks with French President Emmanuel Macron in New Delhi, Indian Prime Minister Narendra Modi also highlighted the solar alliance and cooperation between the two countries in the fields of defense, security, technology, space and counterterrorism. Macron, who arrived in New Delhi on Friday for a four-day visit to India, said France and India should be key partners. “And I dream to have more and more Indian citizens coming to France – studying, becoming entrepreneurs, creating startups – and I want my country to be a best partner in Europe, an entry point,” Macron said at a reception ceremony. Modi said it was critical for the two countries to cooperate in the Indian Ocean region. “Both our countries believe that for world peace, progress and prosperity in the future, the Indian Ocean region is going to play a very important role,” he said. To help ensure freedom of navigation, the space agencies of the two countries signed an accord to help them detect, identify and monitor sea vessels. The two countries also agreed to exchange information and technical experts in the fields of environment and climate change. The nuclear agreement is considered significant, with critics saying that Jaitpur, the site of the six-unit plant, which is to generate 9,900 megawatts of power in western India, is in a seismic zone. The opposition has grown since Japan's nuclear accident in 2011, with several villagers refusing to hand over their land to the Indian government for the project by the French nuclear energy company Areva. Another agreement envisages reciprocal logistical support between the two countries' armed forces. In 2016, India signed an $8.78 billion deal with France to buy 36 Rafale fighter jets in “ready to fly” condition, meaning they will be made in France. On Sunday, India and France will co-host the first meeting of the International Solar Alliance, an initiative launched by the two countries on the sidelines of the 2015 Paris Climate Conference. India says that access to solar technology is becoming a reality with costs coming down and grid connectivity improving. The objective of the solar alliance of more than 120 countries is to work for efficient exploitation of solar energy to reduce dependence on fossil fuels. France is the ninth-largest foreign investor in India. Bilateral trade between the two countries touched $10.95 billion during April 2016 to March 2017, according to India's External Affairs ministry. India's main exports to France include textiles, boilers, electrical machinery and equipment, organic chemicals, railroad rolling stock, mineral fuels, leather goods, and gems and jewelry. France mainly exports aircraft, medical instruments, organic chemicals, iron and steel, plastics, pharmaceuticals and chemical products to India.